The restored Carnegie building will soon re-open as Hotel Indigo Atlanta Downtown. The flatiron shaped Carnagie Building lost a bit of it's cornice during the tornado of March 14, 2008. You can see the vine decoration missing on the left side of the point. Architect G. Lloyd Preacher designed it as the Wynne-Claughton Building. 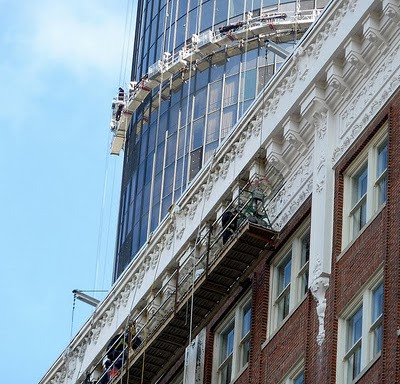 They are converting this wonderful building into a hotel and fixing the tornado damage in the process. Fixed and beautiful. If you are downtown, don't forget to look up. Atlanta just finished Fire Station 18 in Kirkwood. 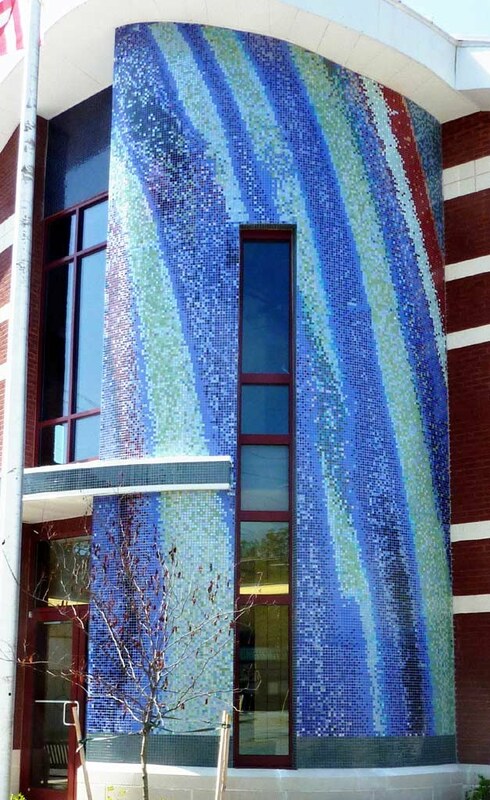 It features Deanna Sirlin's "Falling Waters," a remarkable 29 x 14 feet mosaic. Kirkwood isn't on the way to anywhere, not a hip destination right now, but it's worth multiple visits and rewards exploration. You'd need a guide like me to show you around. It has a quite good Wiki Page though, lots for Architecture Tourists to enjoy. Downtown Kirkwood has the makings of a lovable town center. Parks, library, post office, police station, many churches (and Churches Fried Chicken), funeral home, mansions, bungalows. It is more like a small town than a real small town. It's mostly level ground, rare in Atlanta. Studio ALA (Li Qi, Zhi Feng, George Hornbein and Nathan Koskovich) designed Fire Station No. 18. You may have stumbled by their Eureka Drive studios near ADAC. Do you like the new Firehouse? I do. Modern and historic in one package. It keeps my eye moving. Did they build the fire house behind a waterfall? Compared to Arden's Gaden, it's modest. Kirwook is funky enough to take it in. It's certainly in keeping with the 1927 Sutton and Whisenant Building. It looks great framed in a bay of the Kirkwood Car Wash next door. Is it a Mondrian? Don't those doors look great? Inside, the fire trucks and firefighters are ready to help. I feel cool and calm up close. I wonder, what if Sirlin switched that red tile and the turquoise tile? I hope you'll see it one day. At Terminus 200 ( intersection of Peachtree and Piedmont Rd in the lobby. P.S. Thanks to PB & J Gallery in Kirkwood for last night's reception. More pictures here. P.P.S. Here is Kirkwood Car Wash's Facebook page. Thanks to owner Stuart Brady for saying hello last night. He was out on a Friday night making sure everything was clean and working properly. I'm always on the hunt for videos that combine art/design/architecture with music. I hope Blue Remembered Hills and Dino Marcantonio, Architect don't mind me twisting their visual ideas into aural ones. Blue discusses Billy Baldwin: "The more one attempts to analyze it the further it seems to recede, as does a dream that fades more quickly the harder one tries to remember it." Mr. Marcontonio critiques modern architecture: "...that Beauty is an infinite mystery and that its presence in an object provides a bottomless fund of delight..."
Here is a 1:45 excerpt from New York Polophony a quartet of opera singers performing a 350 year old tune in The Church of the Ascension in the City of New York. I watch it in HD. Here is a longer version at lower quality but you can see the carved and mosaic angels above the altar. The angels seem as ancient as the music. I can't listen to these in the background. Domenick punched my architectural nirvana button and I can't get up. Emmie, Angela, Ally, and I toured a working architects' studio last month. It was the Atlanta Studio of Historical Concepts in Glenwood Park. Domenick Treschitta, project architect for the 2010 Southern Living Idea House in Senoia Georgia, gave us the tour. Here is Domenick in the white shirt explaining stucco over real masonry. The entrance to the Historical Cencepts live-work townhouse is between the tall bushes right behind Domenick. Glenwood park was designed in part by Historical Concepts. They designed their building inside and out. They retained and demonstrated the flexibility of the space while turning the garage and main living floor into studios. The space wasn't staged for a magazine spread or even a group of bloggers. It was full of hard working architects designing classic / traditional buildings, pattern books, and plans for clients across the country. It was full of folks designing beautiful things. Let me show you around a bit. Here is the stair looking back toward the front door. Notice the very tall ceiling. It solves the problem of the sloped lot. See the slope? The ground floor is the "retail/work" space for the live-work townhouse. That level also has a full bath so you could sleep down there. The alley side has the two car garage which shares the ceiling level with the ground floor. It's a split level. 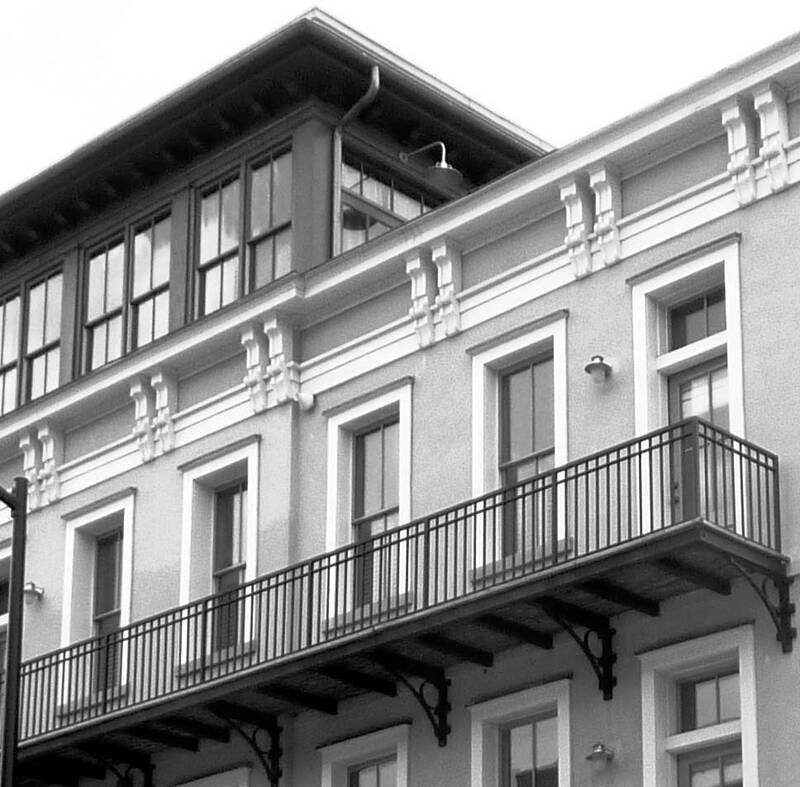 The first level with full balcony is the piano nobile. Anyway, upon entering the front door we see a spectacular room that Historical Concepts uses as a meeting space. I couldn't get a good picture but let me assure you that it was a great room. You can see how they took advantage of and mitigated the tall ceiling with beautiful woodwork. The light fixture is by Eloise Pickard. I would have stayed there until they called the police but I'd heard there was a rooftop deck. We headed upstairs to the garage level. They'd converted the garage into a studio full of architects and architect gear including models. The watercolor guy was an architect paying his dues. He was huddled in the corner with his little paint trays. The walls were covered with renderings of beautiful places. Look closely at the big one on the upper right. You can click here to make the picture a little bigger. I wanted to look closely at every one but there were folks working in there. So up the stairs again to the first full floor. This would be the main living area, kitchen, and maybe a bedroom. Windows faced east, north and west, balconies to the north and west. It's another studio, another great space. On the wall, pages from a pattern book for a place in Alabama. A lot of beautiful designs. Perhaps few of them will be built. A small tragedy: this is folio that won't be available for purchase or for check out from the library. It might be a proposal for an unbuilt project. So far we've seen the entrance level, the garage level, and the main living level, all purposed as a working studio. Two more levels to go. Above the piano nobile is another full floor with balconies. Somebody actually lives there and quite nicely I'll bet. We didn't get to tour that floor. But I would move in sight unseen. So up the final flight to the roof and rooftop room now used for meetings. What windows, what a room. Ally wanted to work up there, me too. Beautiful exterior paneling. This is the top of the stairwell. To the northeast is this yellow house that I adore. We wanted to move in. See the transom doorway to the balcony? I like the townhouse next door too: fancier windows quieter cornice. Quant la doulce jouvencelle - medieval letters and love songs. This video features a love song from the 15th century: "Quant la doulce jouvencelle" performed by Asteria. It pleases me on many levels. I'm without my "duet partner" for the night and I'm feeling rather sentimental about her. These ancient walls are as mysterious and familiar as the tune. Any French speakers out there who know the lyrics? It's a 3:37 video that I can't even embed. You'll have to click the link below. Magazines, TV Shows, Blogs bring us more design than ever, more interaction than ever. But I'm not satisfied. With all the interest, with all the talent, with all the technology, we should be doing better. It's criticism in a human voice. It's educational entertainment that leaves me thinking. It's a breath of fresh air. I think it shows up lifeless real estate ads full of marketing keywords, scripted celebrity TV design shows, and worshipful brand building magazine articles. Mary Louise Schumacher produced this superb video and I want more. Bravo. Click here to see the video: The E.D.G.E. (An Experimental Dwelling for a Greener Environment) A "micro" house on a bluff. Bloggers meet, stroll, win in Castleberry Hill. It was the hottest Castleberry Stroll. And Blayne Beacham took the hottest photos. Blayne won the Artist Trifecta Art Gallery Photography Scavenger Hunt Grand Prize. You can see some of Blaye's prize winning pictures here. Blayne's prize-winning work filled a gallery wall. Atlanta bloggers braved shiny foreheads and the heat to support Blayne. Here I am with Blayne and blogger Cristi Holcombe from Charm Home. On the left is Blogger Niki McNeill from Single Bubble Pop. In stripes is blogger Claire Watkins of High Gloss Blue and Claire Watkins Interior Design. Here is Amanda Brown, grand poo-bah of Artist Trifecta Art Gallery. I don't know how but Amanda stayed cooler than everybody else while managing heat, refreshments, photos and guests. She is the most elegant traffic directer. Amanda has scheduled more Photography Scavenger Hunts for Atlanta and Birmingham. Awards done, we had cooling rain that pumped up the humidity but gave me the strength to stroll. The giant "Dear John" letter at Peters Street Gallery. Beautiful calligraphy at Peters Street Gallery. I met young architects Courtney Morrison and David Xu. We talked about the MA 10 Tour and hammed it up in front of Juan Manuel Pajares' giant mug shots at Besharat Gallery. Sebastian Picker's "icon" paintings. Besharat Gallery. Roberto Azank's "Still-Life-233" is way bigger than my head. Besharat Gallery. At the Granite Room where I met artist Glen Allen whose work gets spookier the closer you look. This is Glen Allen's "Pop Go the Worlds" in comic book high style. Artists Jordin Lee O'Conner was showing from Arizona. Emerging Art Scene Gallery had its Grand Opening in the Castleberry Point building, food, drink, music, art. 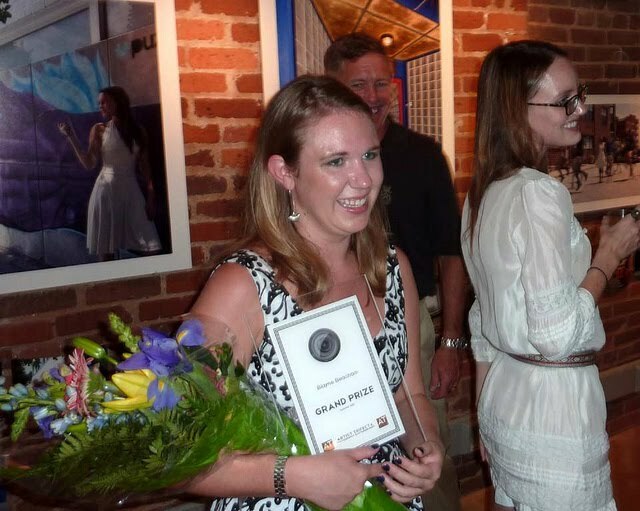 Denise Jackson is the hardworking owner of Emerging Art Scene. Next door a group of grad students from Georgia Tech's College of Architecture opened their studios to us. They were working on Friday night. But that's what architecture students do. They used to space for extra-curricular projects, a garden, an art installation, and a playground. How to move from Home Park to Morningside?